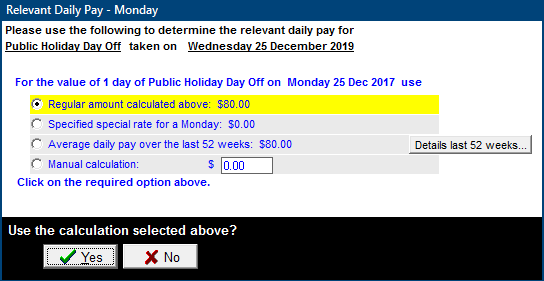 Click here to return to "Holiday Pay and Leave Questions"
The example below is based on showing each day of your pay period and each day of holidays after the end of the pay period. (see also Entering Holiday Pay as a single total in one line). Locate the “extra weeks...” button which shows just above the “Day and Date” column, and click this. You can also show extra weeks by clicking “Days/Weeks to show” at the bottom of the grid and selecting “Add/Remove extra weeks for Holiday Pay”. 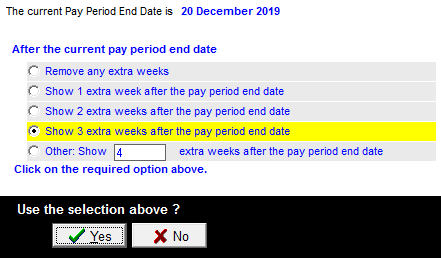 A white window will now appear giving the option to select the number of weeks to show after the current pay period end date. Choose the number of weeks required, and click YES. You will see the additional weeks shown in the grid. These will be coloured green to highlight the fact that they fall outside the usual pay period. 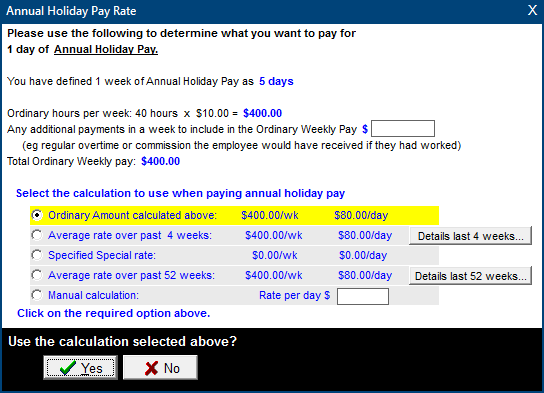 You can now enter Holiday Pay and/or Public Holidays by typing H or P in the Description column. Employee (usually paid weekly) works the 5 days of the week Mon 18 Dec to Fri 22 Dec 2017, and will then take the next 3 weeks off. You will need to show Holiday Pay days and Public Holidays falling within this period. The total pay will therefore be 4 weeks - the week 18 to 22 December plus the 3 weeks holidays. 1. From the main menu, select "Change Date" and set the Pay Period End Date to Friday 22 Dec 2017 (the normal pay period end date in this example). 2. Go to “Enter Current Pay” and select the employee. 3. 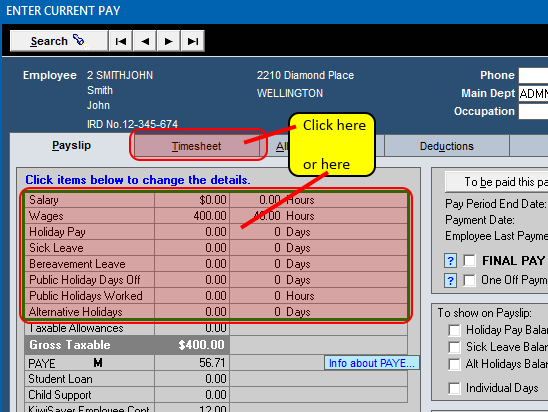 Click on the "TimeSheet" tab or in the top area of the payslip summary. 4. The week ending Friday 22 Dec 2017 will be showing. You can add extra weeks in two ways. select “Add/Remove extra weeks for Holiday Pay”. 5. Select “Show 3 extra weeks after the pay period end date” and click “Yes”. The additional 3 weeks will now be showing in the grid. For your own case of course it would be a different number of weeks. 6. HINT - to see more weeks on a smaller screen click on the magnifying glass at the top right. This can be clicked a second time to revert back to your normal window. 7. Enter any normal hours worked from the 18th to the 22nd of December. Then move down to Monday 25 December 2017, and under the green “Description” heading, type P for “Public Holiday”. Alternatively you can double-click under the "Description" on the 25th to see a list of leave types. 8. The Relevant Daily Pay window will appear. In most cases the highlighted option will be the correct one. hours and the same hours each day, the $ amount you selected previously will automatically be filled in. 10. Scroll down to the next day (in this example Wednesday 27 December 2017) and under the green “Description” heading, type H for “Holiday Pay”. 11. The Annual Holiday Pay Rate window will appear. In most cases the highlighted option will be the correct one. Click Yes. 12. Now enter H on the next lines for days which are not public holidays. The amount per day will be filled in automatically using the Holiday Pay rate entered above. and H for Holiday Pay for the remaining days of the last two weeks. In most cases you should not need to keep selecting a rate - just enter the leave code - P or H - for fast data entry. period is not relevant, since this amount is taxed at a flat rate. 15. Because you entered the Holidays for each day, when records are updated, the dates and amounts for Holiday Pay are automatically recorded. Entering two or more weeks of Holiday Pay in one line. This is NOT a recommended method, because it is difficult for a computer program to work out which days are before, and which days are after, the pay period end. (B) Entering Holiday Pay as single total in one line. 2. 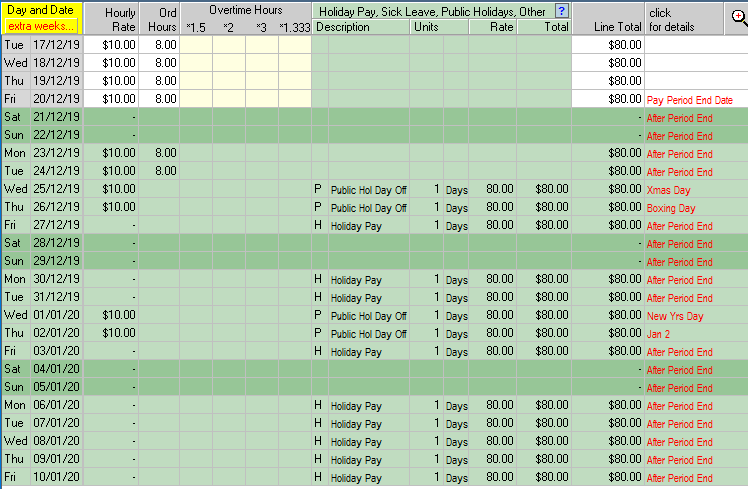 In that new line, go to the Description column and type H for Holiday Pay. Alternatively, you can double-click under the "Description" to see a list of leave types. 3. Select the required rate, and enter the number of days (for example 11 days) in the Units column. 4. You could also process the “Public Holidays” the same way, by adding another line.